Amarok is a great music player for Linux (under KDE), which in their previous version (1.4.4) added support for listening and buying Magnatune music directly inside Amarok itself. Now, Amarok 1.4.5 is out, the 2nd version to support Magnatune. Nikolaj Hald Nielsen, who developed the Magnatune addin to Amarok wrote me to tell me that this version fixes all the known issues and adds quite a bit of polish to the Magnatune store. The Amarok programming team is currently moving Amarok to a major new version of KDE, the graphics environment it's programmed in, and Nikolaj's blog gives a deep explanation of how it's going. The OpenSuse Linux Maintainers have corresponded with me and their 10.2 version is out with Amarok 1.4.4. I haven't checked it to see if they did include Magnatune support in their Amarok distribution in the end -- they had some concerns that I believed to be addressed. I'm *really* excited about the major Linux distributions including Amarok 1.4.4 as that greatly increases our user base and visibility to exactly the right crowd for us. Sebastian Pipping sent me an email recently pointing out a small error in our XSPF implementation, which wasn't a visible problem because I was only feeding the XSPF files to our flash audio player, but he also suggested we make the XSPF playlist files publicly visible. of their choice even with the browser closed. suffers from that. So you have a big responsibility here. so it really is important that you all do your part. Musicmobs have fixed their XSPF on my request by the way. using XSPF because Musicplayer wants that as input. Why don't you put XSPF on your flag instead? "We are not evil"
and "We support open standards" fits together quite well. be ready then to show it. I agree with him, and Magnatune now fully supports the XSPF standard, which a very large number of software programs can play. 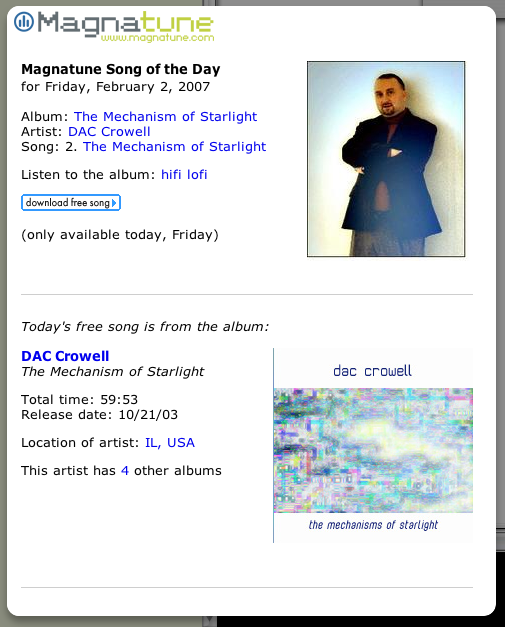 XSPF is nice, because it allows the player to show album art, and a "click for more info" URL, among other things. 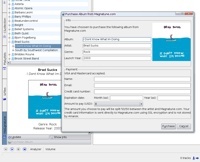 On album pages such as this one http://magnatune.com/artists/albums/belief-eponyms/ you'll see "Play all tracks as an m3u audio stream (or xspf)". This XSPF option also appears on the podcast and mood pages. To add a music stream you need to either own the land or be an Officer/Owner of group owned land. 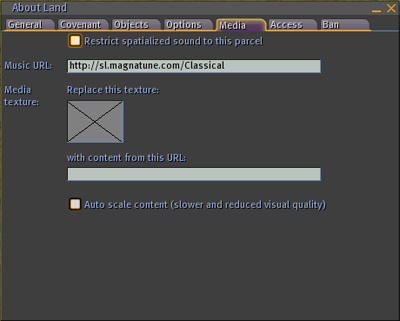 You can also subdivide your land into separate parcels, each with its own Magnatune music stream, just as we've done on the Magnatune SL space. Second Life has an excellent tutorial on this. Tim Spalding, who runs LibraryThing is trying out Magnatune's "what do you want to pay" idea on his book-cataloging web site. I know Tim through my other site, the book-swapping web site BookMooch. We were inspired by something John Buckman is doing at the online record label Magnatune. When you buy a CD, Magnatune asks "How much do you want to pay?" and gives you a price menu. You can't pay nothing, but you get some latitude. You can low-ball them a bit, or, if you're feeling grateful, pay more. It sounded like a fun idea to us. We've had people—and not a few—pay twice to thank us. But we've also had emails from people who say they'll buy a membership next time they get their pay check, disability, etc. Listen & hang out: a large space on Joi Ito's island Kula 1, with themed listening areas for each of our genres (with our streams playing), along with comfy furniture for you to hang out with your friends. 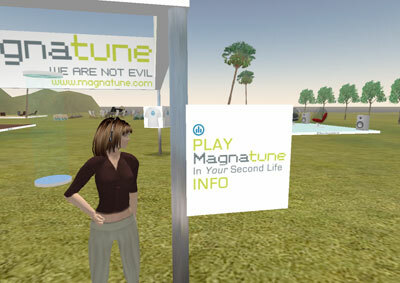 Search for "magnatune" in SL to find it. Music for your land: audio streams for over 40 genres that you can use at no cost in your own land. Click on the sign at the Magnatune space in Second Life for information. and a page about it at Magnatune along with an email discussion group for organizing get-togethers there. 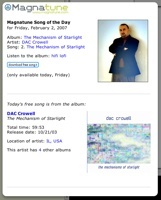 I've written a Dashboard widget for Mac OSX, which shows you the song of the day, and lets you download it. You can download a copy on Apple's software site, by clicking here. I'm working on a dashboard widget for listening to the Magnatune catalog, and have it mostly working, except for a few annoying bugs that may not be surmountable (such as Dashboard getting so little cpu priority, that clicking on our Flash audio player widget often requires several clicks).